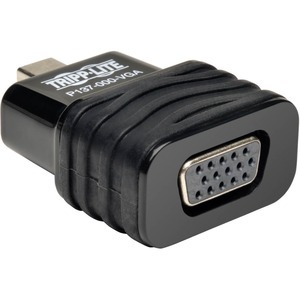 Tripp Lite's P137-000-VGA Mini-DisplayPort 1.2 to VGA Adapter allows you to connect a Mac or PC with a Mini-DisplayPort or Thunderbolt™ TM output to a VGA monitor. Ideal for Thunderbolt™ /Mini DisplayPort equipped laptops, Chromebooks, MacBooks, and Microsoft Surface. Mac 10.11, Windows 10 Compatible. Supports computer video resolutions up to 1920 x 1200, and HD resolutions up to 1080p. Fully-molded compact one piece design ensures long life enjoyment. Features a simple plug and play design with an integrated chip that converts the digital Mini-DisplayPort signal to analog VGA; no drivers or setup needed. Simply plug the adapter into your Mini-DisplayPort /Thunderbolt™ TM source and connect your VGA cable between it and your monitor. Unlike passive adapters, Active adapters convert both Single-Mode and Dual Mode (DP++) DisplayPort output. Ideal for use with graphics cards, such as AMD Eyefinity, that do not output Dual Mode (DP++) signals.